When the defending Men’s EHF Cup champions Füchse Berlin enter the new 2018/19 season there will have already 54 matches been played in the previous round. The European Handball Federation has released the seeding for the new season of the Men’s EHF Cup and Füchse alongside other three German participants and 12 other clubs have been seeded directly to the third qualification round – the last before the group phase. 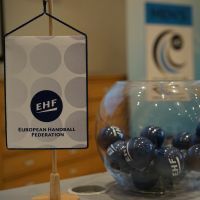 In total 59 clubs will be in action in the new season and the draw on Tuesday 17 July at 11:00 am at the EHF Office in Vienna will determine the all pairings in the first two playing rounds. Three out of four participants of the last EHF Cup Finals in Magdeburg will start in the third round as will the three-time EHF Champions League winners THW Kiel, who are about to enter their first EHF Cup season after 15 straight years in the European top flight. The first leg of the opening round will mark the first game action in the 2018/19 European club competitions on 1/2 September, while the second leg will be played on 8/9 September with 22 teams involved at this stage. In the second qualification round the 11 winners from the first round will join 21 other teams. The first leg is scheduled for 6/7 October, while the reversed fixtures will follow one week later.